We Buy Entire Collections or Just One Patch! We have been collecting Boy Scout memorabilia since 1962 and are interested in purchasing your collection. 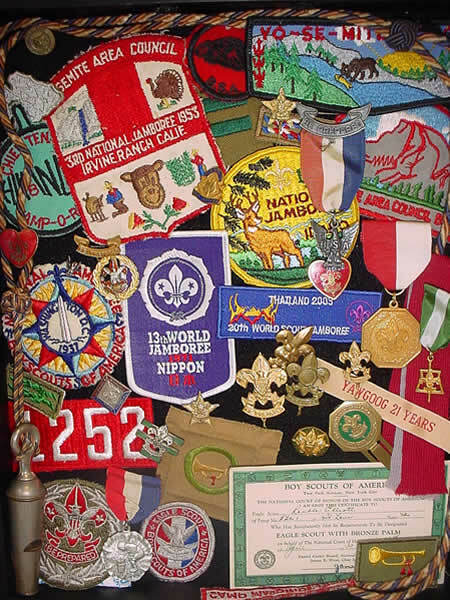 All aspects of scout memorabilia are sought after: Philmont, National and World Jamborees, Order of the Arrow, merit badges, ranks, medals, Red/White strips, etc. We are especially interested in Camp Bob MacBride, Pendola Scout Reservation, Yosemite Area Council and Yo-Se-Mite Lodge (Order of the Arrow) items. Please contact us directly at info@eaglescoutbadge.com. Copyright Â® 2010 EagleScoutBadge.com. All rights reserved. THIS SITE IS NOT AFFILIATED WITH THE BOY SCOUTS OF AMERICA.